After delivering his address, Kennedy and his wife Jacqueline were escorted to the Old Supreme Court Chamber in the U.S. Capitol for the traditional inaugural luncheon. 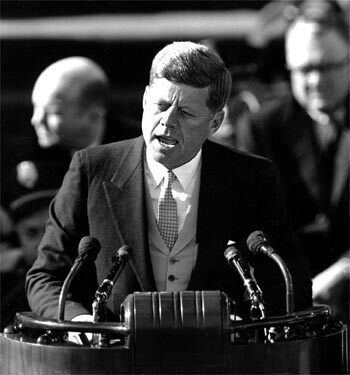 According to Senate historians, the menu items included cream of tomato soup with crushed popcorn; deviled crab meat imperial; New England boiled stuffed lobster with drawn butter; prime Texas ribs of beef au jus; string beans amandine and broiled tomatoes with grapefruit and avocado sections with poppyseed dressing. Although the traditional inaugural luncheon at the Capital dates back to 1897 when the Senate Committee on Arrangements hosted a luncheon for President McKinley and several other guests, it didn't begin in its current form until 1953 when President Eisenhower, his wife, and fifty other guests dined on creamed chicken, baked ham, and potato puffs in the Old Senate Chamber. Since then, the Joint Congressional Committee on Inaugural Ceremonies has organized a luncheon celebration at fourteen Presidential Inaugurations. Often featuring cuisine reflecting the home states of the new President and Vice President, as well as the theme of the Inauguration, the luncheon program includes speeches, gift presentations, and toasts to the new administration. FOOD FACT: According to historians, President Kennedy preferred orange juice, poached eggs on toast, crisp broiled bacon, milk and coffee at breakfast. For lunch, he enjoyed all kinds of soup, especially New England Fish Chowder. As for dinner, there were no particular favorites, although it has been said that liked lamb chops, steak, turkey, baked beans and mashed potatoes. He also enjoyed corn muffins, and, for dessert, if he had any, it would likely be something prepared with chocolate. Biographers say that Kennedy was a light eater and often had to be reminded that it was dinner time because "politics always took preference over food."